This document will walk you through connecting to the UCI Health VPN with your UCI Health owned computer. It will also cover some basic troubleshooting of the VPN. This document assumes that you have a UCI owned asset that you would like to connect to the UCI Health VPN. How do I get access to the VPN? If you do not meet these criteria, then you cannot connect to the UCI Health VPN until you do. 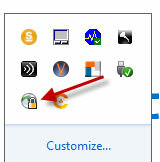 If you recently recieved a UCI owned laptop, then you should already have the VPN client installed. If you do not, please contact the service desk at 714-456-3333. If you do meet these criteria, and you need the VPN client, please call the service desk at 714-456-3333 and they can deploy the software to your machine. Once you have the VPN client on your computer, connecting to the UCI Health network as never been easier. If you take a look at your desktop, there should be an icon that looks like this. To begin connecting, simply double click the Cisco AnyConnect Secure Mobility Client. Once you have done so, you will then see a window like this appear. 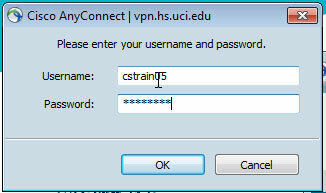 Verify that the address here says vpn.hs.uci.edu. Once you have done that, type in your HS credentials and click OK.
Once completed, you will see a final window like this. After this window as appeared, you are now successfully connected to the VPN. If you need to access the Cisco AnyConnect Secure Mobility Client, you can find it located in the tray by the clock, as pictured here. Using the VPN is easy, once you are connected, as discussed on the Getting Connected section of this site. You can now access everything as if you were physically at UCI Health. This includes home drives, shared drives, databases, Quest, as well as any other application. To access your commonly used applications, simply open them like you would when you are physically at the hospital. Please note, your home drive may take up to 1 minute to connect. If you experience issues with the VPN, here are a few tips for you. If the VPN or your network is not working properly, please reboot the computer, and possibly your home router before further troubleshooting is done. If you recieve an error about "No logon servers are available to service your request", please log-in once while connected here at UCI Health. If your home drive never reconnects, please give it up to 3 minutes (typically less than 1 minute). If it doesn't reconnect after that, please verify network connectivity and call the service desk for assistance. If you run into any other issues, please contact the service desk at 714-456-3333. If you need further assistance with the VPN, or anything else. Please, contact the service desk at 714-456-3333.